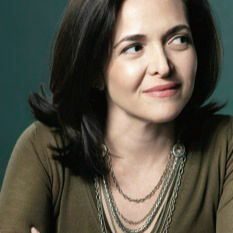 Sheryl Sandberg is a powerful working mom and she wants you to be one, too. There's been a lot of hubbub about Facebook Chief Operating Officer Sheryl Sandberg and her book, Lean In: Women, Work and the Will to Lead. The truth is, even though I'm a working mom and it seems I should either be annoyed or thrilled about her new book, I haven't been able to pay as much attention to the controversy as I would have liked. My son has been sick all week with a nasty stomach virus that, without going into too much detail, includes everything you think a nasty stomach would entail. He's also potty training—so sometimes he makes it to the bathroom and sometimes he doesn't. Since he can't go to preschool, I've been splitting my days between mornings at home taking care of my son and then tag teaming with my husband so I can leave for the office at noon and squeeze in a full days work in a half day so I can get home to put my son to bed. From what I've learned so far about Sandberg's book, I'm all for it. (Here's a quick overview if you've also been too busy to read it or reviews.) I didn't go to business school and I'm not a high-ranking executive, so I haven't been exposed to the kind of education and experience that Sandberg has. But even if I never become a COO, that kind of business savvy can come in handy in—and out—of the office. I'd love to know how to successfully negotiate for a raise or the best ways to stand out at work. And I'd like to learn more about how Sandberg tackles her role as a working mom. Touting her book in Time magazine she says, "Having it all. Perhaps the greatest trap ever set for women was the coining of this phrase. No matter what any of us has—and how grateful we are for what we have—no one has it all. Nor can they. The very concept of having it all flies in the face of the basic laws of economics and common sense. Being a working parent means making adjustments, compromises and sacrifices every day. When I remember that no one can do it all and identify my real priorities at home and at work, I feel better—and I am more productive in the office and probably a better mother as well." I realize that Sandberg has many more resources that I, which likely translates to more childcare and greater job flexibility when one of her kids is sick, but I totally agree with what she has to say on the topic of "having it all." And this week was testament to the fact that balance is hard to come by as a working mom—COO or not. Checking email at home while taking my son's temperature isn't ideal. Either is waking up in the middle of the night to calm a sick and crying preschooler (and knowing that in less than four hours I'll need to get up again to get ready for work). I, for one, am happy to get some advice from one of the few female COOs on how to be the best I can at work—and, as a result, be a better mom for it.